Titanic was docked in Belfast on April 2nd, 1912 for her fitting out. A bedroom steward named Frederick Dent Ray, after stopping to watch a carpet layer at work in a first class stateroom on C deck, noticed several small discarded scraps of green carpeting laying in a corner. Since it was too small to be used anywhere, permission was given and Mr. Ray took it home to show his wife. He survived the sinking of the Titanic and after returning home built a piano stool for his wife. He discovered that the scrap of carpeting he had removed from Titanic made perfect padding for the seat of the stool. It's existence was eventually forgotten until after Mr. Ray's 90th birthday when packing up the piano stool, it tipped over revealing the scrap of Titanic carpeting. 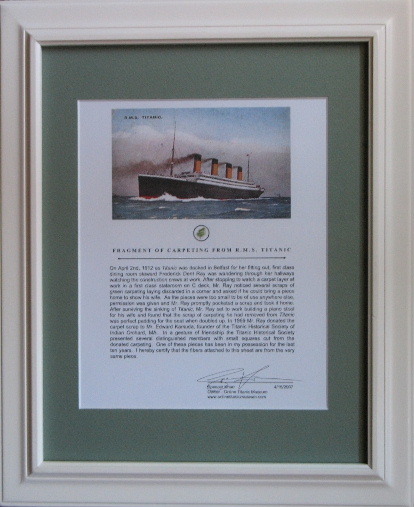 Special thanks to Spencer Knarr of OnlineTitanicMuseum.com for this generous gift.